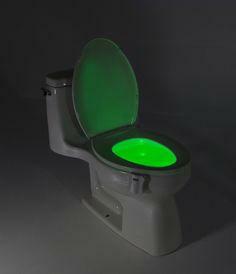 GlowBowl (USA) Motion Activated Toilet Nightlight. Thread: GlowBowl (USA) Motion Activated Toilet Nightlight. ^ That's what our Loo looks like when the Lassie's had a dump after eating one her famous papaya salad. I have a torch stitched into my arse that does the same thing, the light is blue. On special at Pantip, 10 baht 50 Satang. Looks just like an aerial view of an evening kick off at Villa Park. Motion activated? Just hope the motion is in the right place when flying blind in the dark. I would like one that slowly changes colour with your mood as you are sitting motionless in deep contemplation. UV could be good for the moon-white arse-cheek complexion. Hope it does not give you sun burn if you are parked there for a while with the constipation!